Would you like to start your own sportbook? We are committed to achieve excellence by providing our clients with sophisticated, state-of-the-art sports betting script. Our product line includes: web based, mobile application, betting shop and live betting software. These products are developed with flexibility in mind in order to adapt to new requirements efficient. This way our software platform can be customised for you needs in variety of different ways. Starting with interface translation to your target market language, multiple currencies support or with tailored web page skin for niche markets. We welcome the opportunity to work with new partners and every sales enquiry is important for us. Do not hesitate to contact us if you need more information about our services want to have consultation on your project. Our sports betting script offers all the necessary tools including odds and events management, advanced player reports, accounting and more. We provide mobile application which is compatible with iPhone, iPad and smartphone users using Android OS. It helps your clients to make bets instantly from any place. 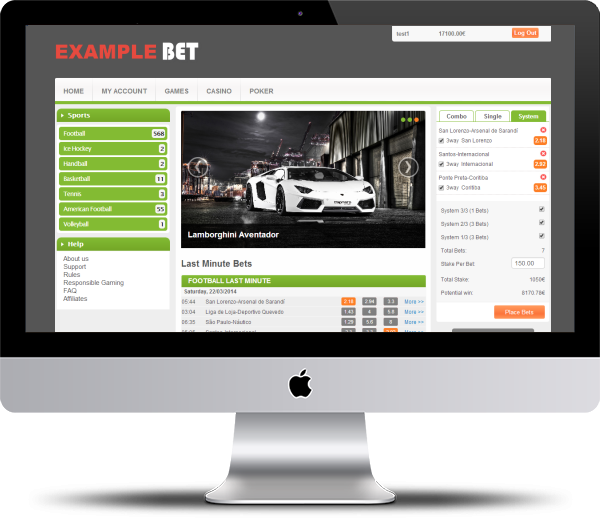 Our Betting Shop software will help you to keep up with all the available events and control your liability. You will be able to use it alone or link it with your primary site. We provide Multi level Agents which offers analytic and managements tools to help our clients successfully run their own business.